One lift of the Wandrd PRVKE backpack and you’ll immediately notice something that sets it apart from different backpacks. It’s extremely light. I was recently sent the 31-liter version of the PRVKE, a backpack that is not only light, but extremely comfortable and customizable. I’ve reviewed several backpacks in the past, but have really yet to find one that struck me as much as the PRVKE when I first saw it at WPPI. Needless to say, the PRVKE is now my go-to backpack for daily, weekend and travel adventures with my camera gear. Other backpacks I’ve reviewed seemed heavy. I thought that maybe this was because it was a backpack that was keeping my camera gear secure. I got used to it, despite it making me sweat in the extreme summer heat (and even in colder temperatures). The PRVKE doesn’t have this problem, as I’ve worn the backpack while photographing for a few hours at a time. Needless to say, this backpack is the most comfortable I’ve ever used. Weighing in at just 3.4 pounds, eventually you barely even notice it on your back. I used the backpack while unsuccessfully chasing down the Aurora Borealis, and my gear included an Olympus OM-D E-M1X, 45mm f/1.2, 7-14mm f/2.8, 12-40mm f/2.8 and 40-150mm f/2.8. And I hardly even noticed I was carrying all of that equipment. The bag sat at the proper height on my back and was easy to adjust when I had to. The straps are extremely comfortable, and the back of the pack is padded very well. The bag also comes with a sternum and waist strap for even weight distribution. Finally, the PRVKE is also made of Waterproof Tarpulin and Robic 1680D Ballistic Nylon — which is weather resistant. Before I even mention how much I can fit into this bag, let me tell you that this backpack lays flat. That means you don’t have flaps trying to close or struggling to stay open. Packing the PRVKE is so much easier than any of my other bags. The main compartment is opened from the back and holds Wandrd’s Camera Cube. If you order the photography bundle, you’ll get the Camera Cube included inside the bag. Depending on the size of the pack and gear you have, you can expect to hold a camera body and 2-3 lenses with the small version, or up to five lenses with the medium version. It can hold the Olympus 300mm f/4 lens lengthwise (which is the largest lens I have), plus one or two other lenses and my camera body without a problem. The Camera Cube is customizable, coming with a Velcro divider system that’s secure yet doesn’t take up a ton of space. Wandrd includes plenty of dividers — I found myself taking two of them out for my setup. I was initially nervous about the bag when I first put in my E-M1X, as it does stick out from above the Camera Cube’s height. But the zippers are flexible enough to still zip up, and I didn’t notice it one bit when it was on my back. If you photograph with a camera that has a grip (or built-in grip), I recommend checking this. There’s also a large top compartment, a zippered compartment, a 15″ laptop and tablet sleeve and a front zippered compartment. The bag also offers quick side camera access, large magnetic tote handles, weather-resistant zippers, a water bottle/tripod pocket, lens cap catch, key pocket, interior organizational pocket and secure passport pocket. Needless to say, there’s a ton of storage present here. The top compartment is expandable and will fold up when you’re not using it. This means you can take all your gear with you, or fold it down for a more compact backpack. In addition to the plethora of storage I mentioned, the PRVKE comes with a Rainfly for additional protection from the elements. This is tucked away in a dedicated storage area at the bottom of the backpack. 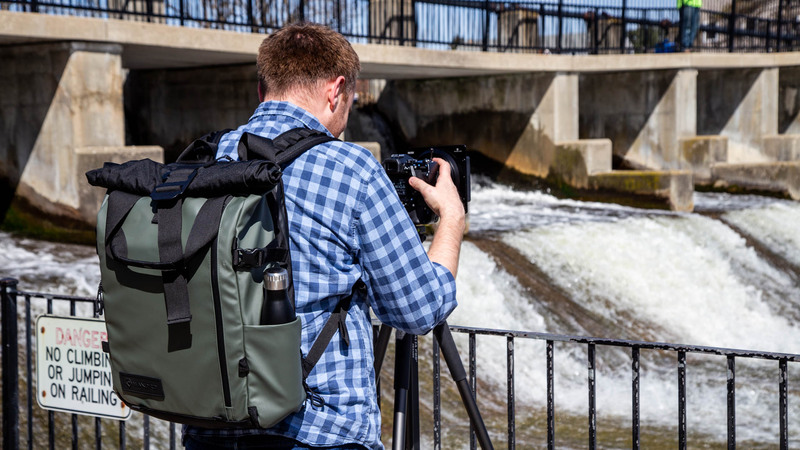 Accessory clips are included with the photography bundle, which can hold larger tripods at the bottom of the bag, or present a mobile workstation if you connect it to the interior of the bag. The Camera Cube is also removable, meaning you can use the backpack for other means as well. After spending about a month with the PRVKE, I honestly have to say this is my favorite backpack I’ve ever used. I feel comfortable for hours wearing this backpack. That’s a huge plus as I start to photograph outdoor events this spring. It holds all the gear I need for a regular photoshoot, or for when I hit the lakeshore for some sunset photos. While it doesn’t come cheap — the 21-liter version with photography bundle retails for $264, and the 31-liter version with photography bundle goes for $289 — it’s well worth it. I can’t emphasize enough how much I’ve enjoyed using this bag so far. I couldn’t be happier that I discovered it! I bought a PRVKE two years ago while in the US on a holiday and I have been using it very happily ever since. It’s a great bag for my needs, carrying my 5DMkIV and several lenses, filters, laptop, etc etc with no trouble. Definitely a happy customer.